Hearsay: "This was carried by a friend of my father way back, don't remember his name." Can you spot the suspicious statements? 1 The seller states that he has no expertise; how can he tell whether the badge is a fake? How could he “not find anything wrong with it” if he has no knowledge of badges? 2 Distressing an item to look worn and adding dirt are easy to do. 3 What old small town museum? Where? This can be easily verified. Private non-profit and government museums (city, county and state) employ trained staffs and rarely close. For-profit attractions, some calling themselves "museums" or "collections" do occasionally sell their collections. 4 What museum and personnel? How can buyers verify his statements if the museum and location are are unnamed and the museum is conveniently closed? 5 Translation: All Sales Final. Failure to thoroughly research purchases, and demand guarantees, before buying. Finding an Authentic Early or Modern Texas Ranger Badge? 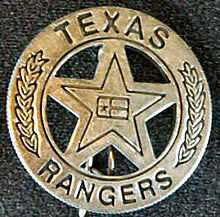 The chance of finding an early Texas Ranger badge on EBay is about the same as winning the lottery. 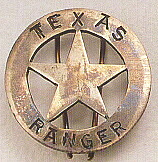 The first references to Texas Ranger badges appear in the mid-1870s. 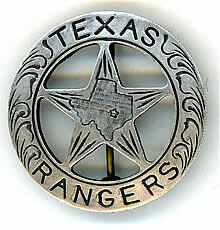 The State of Texas did not provide Texas Rangers with badges, nor did they require that Rangers wear them, until 1935. 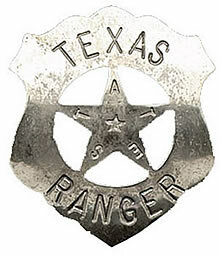 Hence, Rangers wore badges between the 1870s and 1935 but they were not “official.” The few Ranger who wore Badges ordered them from jewelers, gunsmiths and early police supply companies or received them as gifts from grateful citizens. 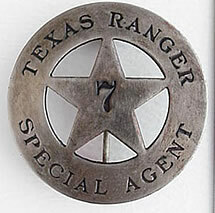 As a result, pre-1935 Texas Ranger badges were of many sizes, shapes, designs and materials. 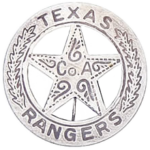 It is impossible to authenticate an early Texas Ranger badge based on composition, manufacture or condition. Patina (the surface appearance of an item) dirt and wear are not indicators of age or authenticity. In fact, forgers spend countless hours making a badges and other items "look right." In the 1800s European craftsmen made highly accurate replicas of 300-year-old suits of armor almost indistinguishable from the originals. Why? Wealthy German collectors sought to recapture their Teutonic past by decorating estates and castles with armor, swords and helmets. Today these replica arms and armor occasionally shows up at auction mistaken for originals. The craftsmanship and more than a century of wear and tear have fooled experts. They say possession is 9/10ths of the law, but it is not a guarantee of authenticity. One hears comments like “the collector had it since the 1960s How could it not be real?! 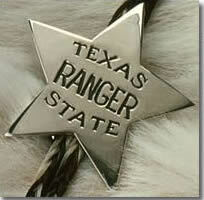 ?” Sorry, but bogus Texas Ranger badges have been made since at least the 1930s. Forgers used the materials, engraving styles, designs and fasteners common to the 19th and early 20th centuries. This article shows many purported 19th and early 20th century badges as well as real modern examples. Some of the badges shown may be real, but no hard evidence is presented proving it. The author correctly notes how rare early Texas Ranger badges are, but then paradoxically states that that some of the examples are unquestionably authentic— based on their "look-and-feel" and the fact that that they were they were owned by well-known collectors. There is no documentation of chain of ownership. A documented chain-of-ownership from a specific Ranger to today—with no significant gaps—is the only strong evidence that an early Texas Ranger badge may be authentic. Lack of provenance frustrates collectors and museum professionals alike. Collectors make a leaps of faith, pay their money and gamble on something that may never be provable. Museums are held to standards of proof—verifiable evidence. The judgment of a museum will often be inconclusive: “possible, or even likely, but not proven.” This accounts for labels in museums exhibits like "attributed to" or "evidence suggests." Over the last few years several alleged Frontier Battalion badges have emerged at auction. The most interesting was attributed to Private W.L. Rudd. He served as a private, corporal and sergeant in Leander McNelly’s Washington County Volunteers (a.k.a. the Special Force) from 1874 to 1877, and in Capt. J.L. Halls' company from 1877-1878. Rudd's service was mentioned in Trails and Trials of a Texas Ranger by William W. Sterling and Taming the Nueces Strip by Texas Ranger George Durham as told to Clyde Wantland. "They [local ranchers] sent down some shiny new badges, and Captain had us pin one on our shirts." 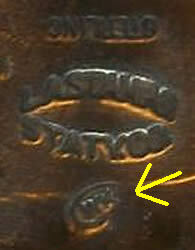 In 2014 an alleged McNelly company badge appeared at auction (above, left) bearing Texas Ranger Rudd’s name and a marking attribued to watchmaker & jeweler J.D. Walker of Cuero, Texas. Was this one of the gift badges presented to McNelly and his men? George Durham mentioned a gift of badges, but there is no description of them. No one knows what the "McNelly company badges" actually looked like or whether Rudd was one of the Rangers who received a badge. No jeweler's records confirm that J.D. Walker, a watchmaker/jeweler in Cuero, Texas, was a source for custom badges. How he marked his jewelry and watches is unknown. No surviving documents from Rudd exist referring to a badge, and there are no known photographs of him wearing one. The alleged "McNelly company badges" have only a superficial appearance to each other. Jewelers producing multiple badges for companies—such as Ira Aten's Ranger company—made close copies to speed and simplify work. The use of "FB" for "Frontier Battalion" is questionable. Capt. Leander McNelly's company was most often referred to as the "Special Force" formed under the Act to Provide for the Protection of the Frontier in 1874. While formed under the same legislation, McNelly's company was regarded as wholly separate from the Frontier Battalion, which was under the command of Major John B. Jones. The auction catalog states that Rudd served as a “private, corporal, lieutenant, and Captain.” The historical record only support ranks of private, corporal and sergeant. No chain-of-possession from Rudd to the present was offered at the sale, nor was the consignor listed. Conclusive evidence it is required to establish authenticity beyond a reasonable doubt. Legitimate sellers, dealers and museums document and plainly present what evidence there is. 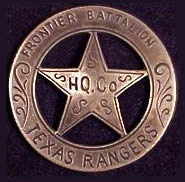 Colonel Homer Garrison, Jr., Director of the Texas Department of Public Safety and Chief of the Texas Rangers, announced in October 1962, that the Texas Rangers are going back to the tradition steeped in history of a Mexican silver badge worn by their predecessors during frontier days. 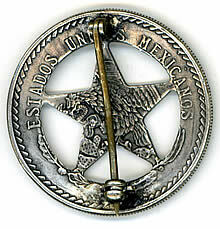 Garrison said the new official Ranger badge, issued to each of the 62 members of the Force, is a replica of the historic original badge which old-time Rangers carved out of a Mexican five peso silver dollar when Texas became a State and their duties changed from military to law enforcement. 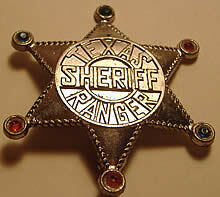 The best information available indicates that the five-pointed star on the badge symbolized the “Lone Star” of Texas. 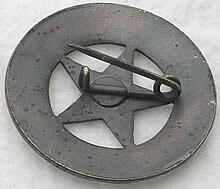 The points are supported by an engraved wheel, which is termed the “wagon-wheel” badge. Each badge is made from a Mexican five Peso silver coin. The oak leaves on the left side represent strength and the olive branch on the right signifies peace. These are taken from the Texas Great Seal. The cut-out center star has engraving on it and the center of the star is reserved for the Company designation or the rank of Sergeant or Captain or Senior Captain. The edges still often have the coin lines and the coin is still highly visible on the reverse of the badge. 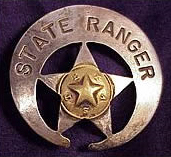 The five point “Lone Star” with a “wheel” around it is common in Ranger and other Texas badges from the late 1800’s. In 1987 the Texas Legislature enacted Texas Government Code Sec. 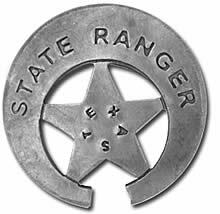 411.017 (see below) making it illegal to manufacture, sell or possess a real Texas Ranger badge or replica of the current design in the State of Texas. To do so is a Class A misdemeanor punishable by up to a year in jail and a fine of up to $4,000. The badge to the right has the discontinued rank of sergeant, but it is still an illegal replica. Its design, size and the inscriptions “Dept. of Public Safety” and “Texas Rangers” violate the statute. Pin it on, or show it to a “reasonable person,” and they would assume it is real. Badges for Sale at Auctions or Charity Fundraisers: Current-design badges sometimes appear at auctions and charity fund raisers. They were often donated by descendants of Rangers or retired Rangers. Prior to 1987 their sale was legal; some older Rangers and their descendants are unaware that their sale is illegal. 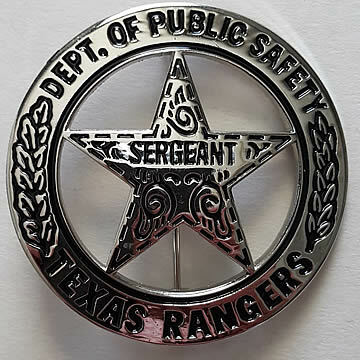 Wearing a Badge or Replica: Wearing a current-design Texas Ranger badge can be considered impersonating a police officer, a Class B misdemeanor punishable by up to 180 days in jail and a fine of up to $2,000. Living History Reenactments, Movies & Television: There is no restriction on living history performers (reenactors) wearing replica 19th century badges in their reenactments. However, if the badge is of the current design, only the Director of the Texas Rangers Division can grant permission, and then generally only to motion picture and television productions. Out of State: Texas law is generally enforceable only within Texas. However, other states—and foreign countries—have reciprocal laws preventing trade, possession or wearing of law enforcement insignia and credentials. 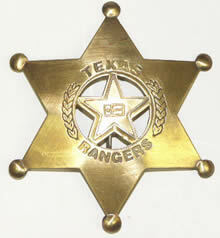 Manufacturing, buying, selling or wearing a Texas Ranger badge in New York could get you arrested! 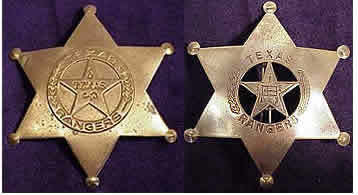 Shipping current-design Texas Ranger badges or replicas by United States mail, or by any type of commercial carrier, is a separate Federal offense. Uses the term “Texas Department of Public Safety,” “Department of Public Safety,” “Texas Ranger,” or “Texas Highway Patrol” in connection with an object, with the intent to create the appearance that the object belongs to or is being used by the department. (b) In this section, “department insignia” means an insignia or design prescribed by the director for use by officers and employees of the department in connection with their official activities. An insignia is deceptively similar to the department’s if it is not prescribed by the department but a reasonable person would presume that it was prescribed by the department. (c) A district or county court, on application of the attorney general or of the district attorney or prosecuting attorney performing the duties of district attorney for the district in which the court is located, may enjoin a violation or threatened violation of this section on a showing that a violation has occurred or is likely to occur. (2) in an artistic or dramatic presentation, and before the use of the object the producer of the presentation notifies the director in writing of the intended use, the location where the use will occur, and the period during which the use will occur. Acts 1987, 70th Leg., ch. 147, Sec. 1, eff. Sept. 1, 1987. Amended by Acts 1989, 71st Leg., ch. 496, Sec. 1, eff. Sept. 1, 1989. Replica – an accurate or inaccurate copy of a real badge. A replica may violate the badge statute, but it does not constitute fraud unless it is advertised or sold with the statement or implication it is authentic. All of the badges shown above are based on the current 1962 current badge design. All of them, especially the one on the second row, left, with “Dept. of Public Safety” might be presumed to be real and thus would be illegal. Company “A” type badges, by far the most commonly seen today, are inaccurate replicas. 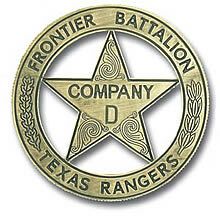 The most commonly seen replica badges bear Texas Ranger Company designations Co. A, B, C, D, E, F, HQ and the old Frontier Battalion. Legitimate jewelry makers (cuff links, earrings, buckles, etc.) do incorporate fake or fantasy company badge design. Some latitude has been extended by Texas DPS for decorative use where there has been no intention of fraud and "Texas Dept. of Public Safety" is not used in the design. Unscrupulous sellers often state “you can tell its real because it was made from a Mexican coin.” Many replica badges have impressions of Mexican or U.S. coins cast into their reverse. A few older forgeries were made from real Mexican coins when silver was cheap. Real Mexican coins are produced in mechanical coin presses, not cast. A practiced eye can often see casting lines, errors in detail or distortions in lettering caused in the casting process. There are also examples, alleged to be from the 1880s and ’90s, with the image of a 1947-48 five pesos coin on the reverse. Evidence of time travel? 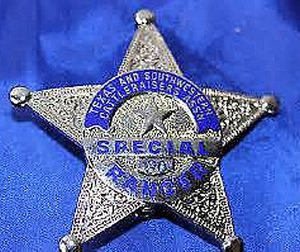 As of this date, no conclusively authenticated Texas Ranger badges are known to exist with “Frontier Battalion” or “F.B.” engraved on them. The Frontier Battalion was in service from 1874-1901. Some Frontier Battalion fakes have cast replicas of 1940s Mexican coins on their reverse. This badge is a close copy of an unpopular enameled style worn by the Rangers briefly in the 1950s. It was disparaged as the "Blue Bottle Cap" badge because it looked like a bright top of a 1950s soda bottle. Despite the fact that Texas Rangers hated it, it is now appearing on the market in fairly large numbers. Some variations of this badge have been made for use by security agencies and park rangers. This is a replica of the historic “Kid Rogers” badge licensed by the Texas Ranger Hall of Fame and Museum. It was produced to give collectors a close replica of an early Ranger badge and to provide living history performers with an accurate prop. To discourage misrepresentation of these replicas as “real” badges, they have “replica” permanently marked on the reverse. Several minor changes were also made so the museum can confirm them as a replicas. Fantasy badges bear little resemblance to any authentic badge. They may incorporate design elements from real Ranger badges, military insignia, and other police badges as well as the designer’s flights of fancy. There are also fake artifacts made to look like Texas Ranger equipment. 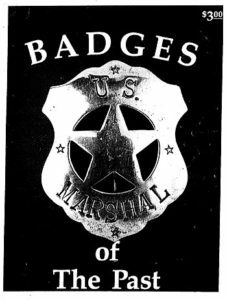 This fantasy badge resembles the half-moon New Orleans police badges and presentation badges from the Old West. It has a brass Lone Star and T-E-X-A-S element similar to that on the 1835 Texas Flag and items used by Confederate Texas troops in the Civil War. 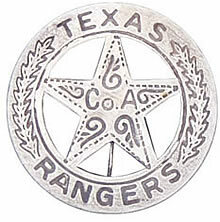 Six-pointed star badges abound, but the design was never used by the Texas Rangers. The badges on the left are among the older fantasy badges and have been used extensively in posters, postcards and art. They have been sold over the Internet as “1800s” badges despite 1960s design features. Special Ranger commissions have been given to sheriffs, private railroad detectives, oil company security officers, cattle detectives and retired DPS personnel. However, they were never issued badges similar to this one. This fantasy badge is commonly found at auctions and at gun shows and advertised over the internet as a Special Ranger badge. Texas Rangers did use US Army Mills-pattern webbed cartridge belts (“scout belts”) in the field. However, they had plain buckles and none are known to have been stamped or engraved with Texas Ranger badges or insignia. This example was made from a reproduction Mills belt buckle, complete with a fake patent inscription on the back. The “badge” on the front (see below) is loosely based on the 1962 design badge design — not an 1880s badge. This fantasy “Arms” and “Ammo” key ring made of stamped, distressed brass has shown up on Internet sales sites and at auctions. We suspect it was made overseas in India or Pakistan because of themis use of “Sergeant of Arms” instead of “Sergeant at Arms.” There was no such rank or duty assignment. A sergeant at arms is a person appointed to keep order during meetings — not a company quartermaster in charge of supplies, weapons and provisions. 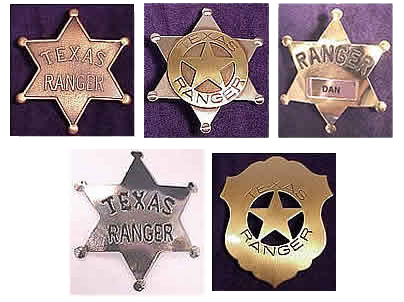 Toy Texas Ranger badges have been made for children since at least the 1930s and many are considered collectibles. However, a few unsuspecting customers have been sold toy badges as genuine ones, complete with letters of authenticity and concocted histories. 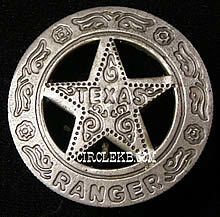 Many toy badge makers have adopted six-pointed star designs —never used by the Texas Rangers. 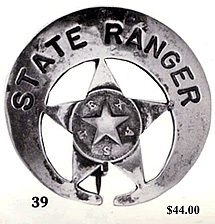 Toy badges are usually made of metal-colored plastic or “pot metal” and are hard to confuse with real Texas Ranger badges. The most commonly seen replica and fantasy badges were manufactured by D.R. Langenbacker & Sons Company of Bluffdale, Utah. They are unmarked and often have details such as simulated Mexican coins on the reverse. “Langenbacker badges” are common at gun shows, EBay and other auction sites, and at flea markets. Unwary collectors have paid high prices for them. Old Langenbacker & Sons catalogs are now rare, so we have included these examples of some of the more common badges with their stock numbers. Please let us know If you have an original Langenbacker catalog. 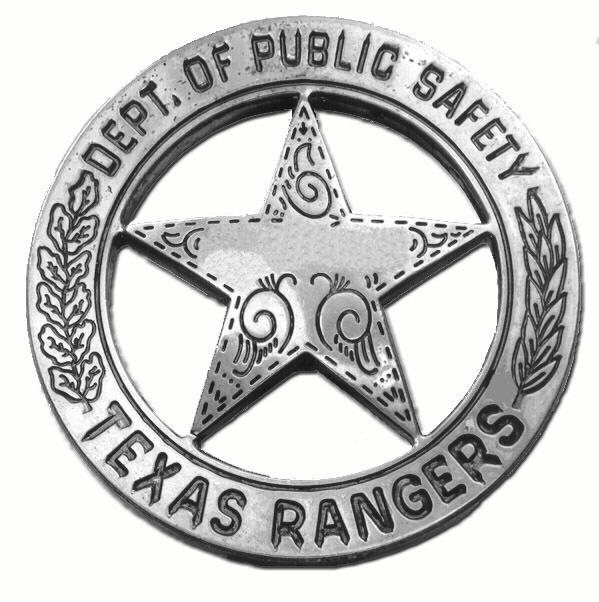 We would like to add missing or better illustrations of their replica and fantasy Texas Ranger badges. Our thanks to Steve Chorney for assistance with sources and illustrations. Texas Ranger Special Agents never existed. This design is similar to a pre-1935 badge style (before official badges were sanctioned) worn by a few Rangers. 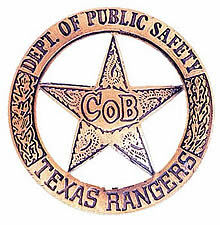 In allegedly genuine examples, the Texas Ranger’s name frequently appeared at the top of the circle. This quality of this badge is well below anything that Texas DPS would have issued. The design borrows elements from the ca 1961 badge. Various Company “A” designs are the most commonly seen fake badges. Note the simulated coin back on this badge. Floral Motif Texas Ranger Badge. This is a variation on Catalog #6. A primary difference is that the elements at either end of the word “TEXAS” are triangular rather than curlicues. 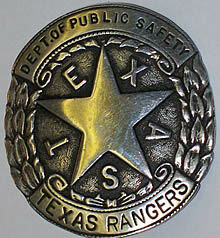 Replica Texas Ranger Shield Badge. Similar authentic shield badges are known. The badge contains design elements from the 1962 badge. This general design was used from 1935 until the 1950s. Langenbacker & Sons Catalog #273 above. The ad states: “It is a historically correct copy of the 1800’s Texas Rangers Co. “D” Badge replicated in great detail.” No authenticated badges are known bearing the inscription “Frontier Battalion.” The design is a derivative of the ca. 1961 badge design. Langenbacker & Sons Catalog #240 above. An authentic version of this badge is known. Langenbacker & Sons Catalog #43 above. This badge, although crude, might be considered deceptively similar to Texas DPS badge, is marketed as such, and therefore in violation of the law. Texas Government Code Sec. 411.017 (a)(3). No. Another example of the ubiquitous Company “A” fantasy badges. Actually, authentic “coin back” badges have been made from eight and five peso silver coins, fifty peso gold coins and gold-plated silver after the price of gold escalated. This is an example of the many Company “A” fantasy badges with a simulated “coin back” cast into it. This appears to be a derivative of the Langenbacker & Sons Catalog #6 and #221 badges above. No; neither the badge nor the story is correct. Actually, Bass Outlaw killed Ranger Joseph W. McKidrict! Several variations of this “1890’s flag badge” are known. They are commonly seen on Internet auction sites identified as genuine badges. Sorry, but the wreaths are a design feature found after 1962. This badge has been incorporated into artwork, toys and posters. Another fantasy badge sometimes sold as a child’s toy. This badge has been incorporated into artwork, toys and posters. 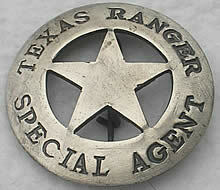 Some cattle detectives, railroad detectives and oil field security men were issued Special Ranger commissions. However, this badge is a fantasy. Made by Sun Badge Co. This badge might be considered deceptively similar to Texas DPS identification and therefore in violation of the law. It is similar to Langenbacker badges #6 and #221. 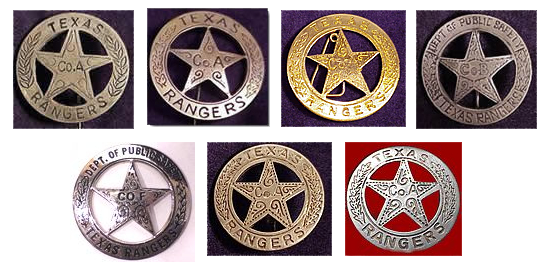 Walter Kuhn made high quality replicas of Texas Ranger badges. They have often been accepted as real because of their superior craftsmanship. They are frequently seen on EBay and other auction sites. Unlike other manufacturers, Kuhn marked his badges with the tiny hallmark WK inside an oval or semi-oval — or simply W.Kuhn. This badge is a replica of the first “official” badge issued by the Texas Department of Public Safety in 1935. It bears the following impression for the L.A. Stamp & Stationary Company with his hallmark below it. This badge is similar to Langenbacker badges #6 and #221. 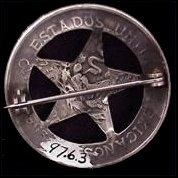 The reverse of the badge shows the blurred casting of a Mexican 5 Peso coin. The star in the center appears to have been crudely welded or soldered to the circular rim. Our thanks to Steve Chorney for assistance with this information and illustrations. There are at least two variations of this six-pointed toy/fantasy badge. One is made of pressed pot metal and may date back to the 1950s or '60s (left). The second variety is sold as a Japanese toy (right), appears to be plastic, with plastic “jewels” set in the points of the star. 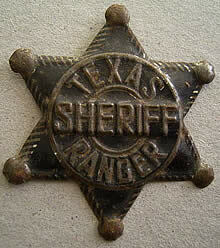 There were no “Texas Ranger-Sheriffs” or legitimate six-pointed badges. “Texas Ranger Special Agents” didn’t exist. 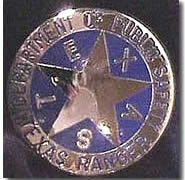 This appears to be a derivative of the Langenbacker & Sons Texas Ranger Special Agent #7 fantasy badge shown above. 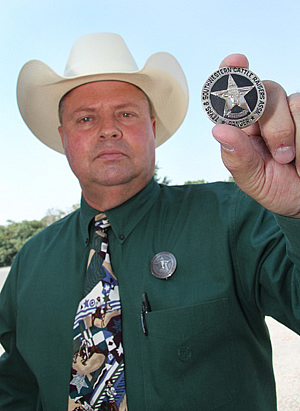 The seller titled it “Texas Ranger Special Agent Police Sheriff Marshal” badge. That about covers all the bases! This badge has been called genuine or a “commemorative” in various sales ads. 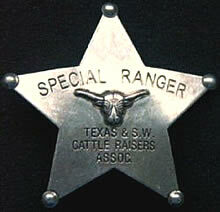 Special Ranger commissions are issued to some cattle detectives by the State of Texas. The real badge resembles current issue Texas Ranger badges. They are not five-pointed stars. This is the crudest fantasy badges we have seen. It is roughly-cut and poorly punched. It vaguely resembles the Langenbacker & Sons Catalog #39 fantasy Badge similar to half-moon New Orleans police badges and presentation badges from the Old West. The seller claims it to be made of silver-plated brass. It is decorated with a Lone Star and T-E-X-A-S similar to the design found on the 1835 Texas Flag. 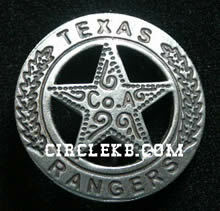 This circle-star replica badge is very loosely based on the 1962 Texas Ranger badge design. The olive and live oak branches are crude in comparison to authentic badges. The “Co CF” makes no sense. The reverse of the badge (not shown) is a coin back design with a reasonably authentic pin and closure. The manufacturer and date of this badge are unknown.